The Beth Am synagogue building, a grand Moorish-inspired structure, was designed by noted architect Joseph Evans Sperry, who had designed such local Baltimore landmarks as the Bromo Seltzer Tower, the Provident Bank Building, and the Eutaw Place Temple, former home of Oheb Shalom Congregation. Sperry first studied the architecturally important synagogues of Europe. Many people comment on Beth Am’s similarity to the Great Synagogue of Florence with its three-arched entrance and Byzantine-Moorish design. When the building opened in 1922 as the home of Chizuk Amuno, it was the practice for men and women to sit separately. 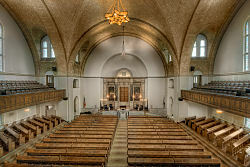 The central section of sanctuary seating, main floor and balcony, was designed for men, while women sat in the side sections. 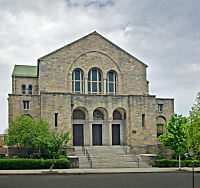 Mixed seating began in the congregation in 1947. The building has been painstakingly preserved. Visitors – and congregants – marvel at the spiritual feeling the sanctuary evokes through the interplay of light, space, sound, and architectural detail. The modernizations necessary to keep Beth Am vibrant have been delicately incorporated into the historic structure. The building and the sanctuary are fully accessible. The next phase of building updates are being discussed now. Be part of the conversation! Learn more about our architectural plans and The Campaign for Beth Am, Tradition and Transformation.